My parents are heroes in my life. I lost both of them at younger ages but I am grateful for the time I had with them and the impact they’ve had both on my life and the lives of others. Over the years, I’ve met so many people who knew my parents and were affected by them in some way. 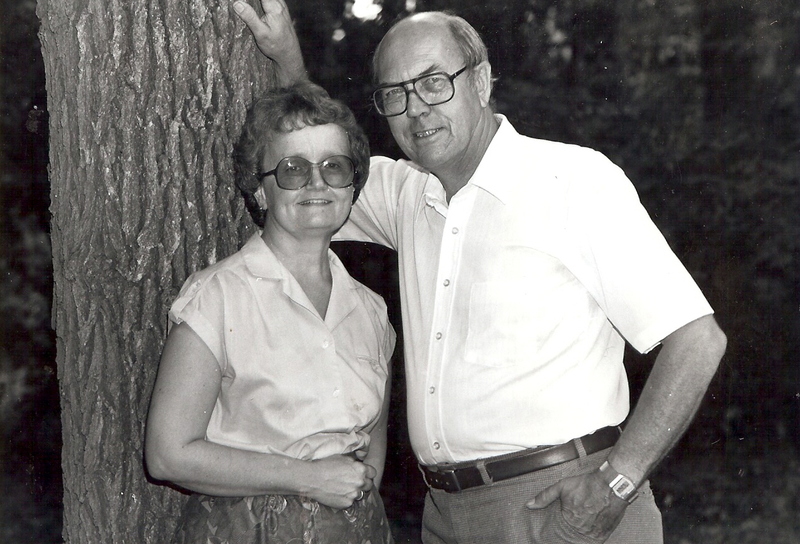 Strangers come up and tell me stories of my parents loving service, strength to hold fast, and their effort to do everything with excellence and 100 percent heart. I have even had people come to me and tell me how they disagreed with my folks in some way and how even then they felt like my folks were their friends. My parents were willing to make hard, unpopular decisions. Not because they wanted to but because it was best and right in the sight of God’s goodness. Their heart was to put up the good fight for those who couldn’t help themselves like those in poverty or foster care, refugees, or hurting friends who needed an advocate. My parents didn’t just take on a cause to take on the cause. They truly stood with resolve behind what they believed in. When they were alive, I never understood how powerful the commitment to stand for what you believe in would have a lasting impact. I just remember them talking late into the night about the struggle of feeling like an island with no emotion left to offer because of untrue rumors, getting excluded in community circles, and even having hurtful things being said to their face because others didn’t agree with what they were doing. Understand my folks were not perfect or rebels. Far from it. They just stood firm with hard decisions because of Christ because it was right and what is the point of something that is good if you don’t fight for it. Remembering these characteristics of my parents is extra precious because there have been many times I have felt like I’ve been in some similar situations. I’ve had to make some hard decisions regarding leadership positions I’ve been entrusted to. Like my folks I tried to make nothing in haste, sought a lot of counsel, and prayed through it extensively. I feel good about my decisions. Yet every decision still involves trust and usually affects other lives. I have tried to my best ability to be loving without vacillating on the choices that seem to be the best. The hardest part is probably hearing information that is going around that isn’t accurate and knowing that people are responding negatively without having all the pieces to the puzzle in any of those situations. It’s hard to resist the temptations of trying to control the info or attacking with self-righteousness to bring justice where I think it’s needed. Those never produce good fruit. I am blessed with friends, colleagues, coministers who stand with me and are for me. Still sometimes you can feel pretty alone. It’s part of leadership and being committed to what you believe. Maybe that’s one the reasons why the Bible talks about trusting in the Lord with all of your heart and leaning not on your own understanding (Proverbs 3:5-6). It’s interesting that God talks about the heart in this verse when it’s the mind and all the “possible scenarios” of what people are saying or doing that fuels fear and hurt. Is it because whatever a person speaks usually reflects what’s in their heart? Is it because the heart is often the metaphor of where Christ lives? Is it because the heart is how we describe our passions, our loves, and dreams, and God wants us to give all of that to Him daily? Maybe yes to all three. To be very open with you: those times are really hard and that’s ok. When I’m in it, I don’t know who will like me and who won’t in the end. I might learn that I need to do things differently. I’m totally fine with that as long as integrity is kept. I always want to see God’s Kingdom come and all involved see how much God adores them and loves them in this. I also do not want to live in my wounds or fear and lean on my own understanding. I’ve always hoped that one day my children will hear from others about how their dad helped them or made a difference so they can be encouraged to fight the good fight. I can’t lead and make choices and measure them solely on peoples agreeing with it. I can’t make every one happy. Sounds cliché but it’s a reality. I must, as best I can, try to stay keep a clear conscience before the Lord. I really want the straight path. I believe that’s what my parents were trying to show me. Living in Minnesota means snow. This year’s snow and temperatures are bad enough to make a polar bear look for a coat. I’m not really complaining, just enlightening. A fun part of the winter though is riding snowmobiles. I grew up on it. I haven’t gotten to do much of it over the years. This year I found a snowmobile on Craig’s List and added it to our family. It’s an older, used one but it can get going, and it’s Ethan’s main thing! 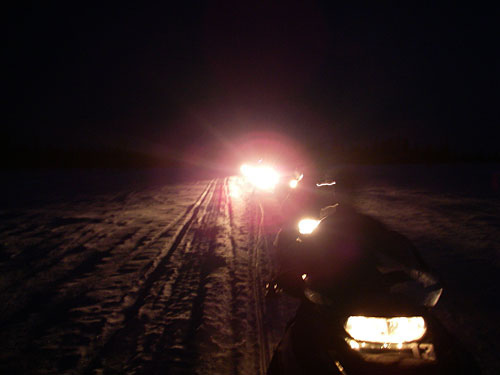 Our neighbor saw our new snowmobile and invited me on a late-night ride through trail in our community. I put my gear on and with a couple of other guys, off we went. It was snowing again (go figure). Watching the snow fall down in the beam of my headlight was fun. Since the trail was new to me, every turn was a new picture. When you ride trails, you stay as group in case someone’s snowmobile breaks down, someone falls off (it happens), someone gets lost, etc. At night you keep an eye out for the taillight of the person in front of you and the headlight of the person behind you. If you can’t see the sled behind you, you stop until they come into view. If they don’t, you turn around to find them. It’s like not leaving family behind. The other part of riding at night is trusting the leader and the signs that mark the trail. It’s the leader who makes the turns that everyone else follows. If he is unsure, he stops so we all catch up and make a group decision. The bottom line is it all comes down to looking for the signs and trusting the signs. On our ride home, we decided to take a different route than when we left. The snow was falling harder but we felt good about where we were going. We were looking hard for some specific signs to know where to turn. Understand these signs are small, orange signs with black arrows. They can be every 100 yards to every ½ mile apart. Somewhere we got turned around and felt we were going the wrong direction. We stopped a couple times to agree on where to go next. Being off-course was a bit unsettling because we were afraid of being lost and running out of gas. Out on trail are gas stations unavailable. We decided to follow the signs running along side a highway until we realized where we were: the complete opposite direction of where we wanted to go. Eventually we made it home and had a blast doing it. Here is the part you need to hear: We were never really lost! Sure we had gone the wrong direction but we were always following the correct signs. We only looked for snowmobile trail signs and not other kinds of signs because the signs we needed where snowmobile trail signs. Listen my friends, so often we get worried about making the right decisions and looking for the perfect direction from God. I’m glad you want to do that as we all need to seek His face and His Will! In God’s amazing grace and sovereignty, as we make choices in our lives, as long as our passion is for Jesus, He will keep us on track and bring us to where He wants us. He is that good. Sometimes a different trail is just part of the adventure God uses to teach us about Him. It was fun to figure out how to get back. The peace we had is always having the right sign in our sight even if it was a little different journey. Are you watching the right signs today? Remember He is before you, behind you, beside you, in you, through you, and for you!